Who owns the Mahanadi's water? This question has pitted Chhattisgarh and Odisha in a protracted battle which seemingly defies resolution. The river originates in Chhattisgarh's Dhamtari district and is vital for the survival and sustenance of lakhs of people in the state. Chhattisgarh, thus, claims the first right over its water. Odisha points out that the river flows naturally through Sarangarh to reach the Hirakud dam near Sambalpur. Therefore, the east coast state has "equal entitlement" to its water, if not more. Odisha government's spokesperson DS Mishra alleges that "indiscriminate" construction of barrages upstream has ended all possibility of the state getting its due share of the Mahanadi's water. Top officials of the Chhattisgarh water resources department counter that it is better to utilise the water than to let it flow unused into the sea as Odisha does. 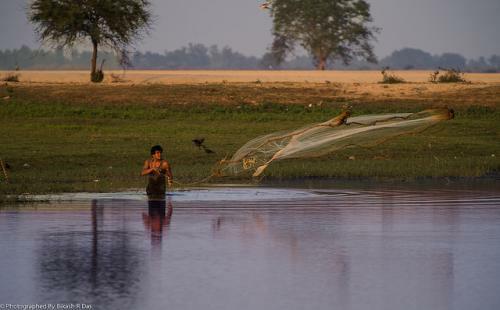 While the two governments wrestle over these claims and counterclaims, the question of the survival of farmers and fishermen who are entirely dependent on the Mahanadi has taken a backseat. A study done by the Forum for Policy Dialogue on Water Conflicts in India, or FPDWCI, shows how the tussle between the two states has overshadowed the debate on the increasing defacement and pollution of the Mahanadi. The river is dying as its natural flow is hindered and the water level is consistently falling. The sale of water to various industries has only aggravated the problem. This, the study concludes, has put the livelihoods of at least 20,000 families of farmers and fishermen at risk. They live along the banks of the river, from Shivrinarayan to Sambalpur. Apart from fishing, vegetable and watermelon farming is the chief source of sustenance for these families. "How would the farmers benefit from the Mahanadi, a large share of whose water goes to the sponge iron plants and power projects in the plains?" the study asks. The dispute over the Mahanadi water dates back to 1983 when Chhattisgarh was still part of the undivided Madhya Pradesh. After differences over water distribution cropped up, the then chief minister Arjun Singh and his Odisha counterpart JB Patnaik suggested the formation of a joint control board. The board is has not been set up till date, although the Chhattisgarh government has recently said it would support such a body. There's speculation that the Odisha government could enter into negotiations for the formation of a joint control board after the panchayat elections in the state are concluded. "The Chhattisgarh government has a transparent attitude on the Mahanadi river issue. We have apprised the Odisha government about our stand, but they are dodging the negotiations," claims Brijmohan Agrawal, the state's Water Resources Minister. Who has the first right? Civil society organisations have demanded that both Chhattisgarh and Odisha should prioritise the right over Mahanadi's water. According to Praful Samant Re, national convenor of various water conservationist movements, the states have failed to acknowledge that the Mahanadi "belongs to the people before anybody else". "Chhattisgarh and Odisha governments favour diversion of the river's water to industrial houses. They are only pretending to fight each other and playing to the gallery by claiming they are working in the public interest. Why is the Odisha government selling water collected from the Mahanadi and its tributaries in Hirakund dam to industries if it is so worried about public interest? By constructing several barrages over the river, the Chhattisgarh government has also made it clear whom it is benefiting," Samant says. Lingaraj Pradhan, convener of the Paschim Odisha Krishak Sangathan, believes the two governments are deliberately fuelling the controversy to weaken the farmers' struggle. "The farmers were forced to launch an agitation against the Odisha government's decision to sell the water from Hirakund dam. They stalled construction of Vedanta company's pipeline from the dam to Jamadarpali region. They were successful in sending back the Korean company Posco," Pradhan says. "Later, the government had to concede that it was wrong in selling excess water to industrial units. Now, it is conspiring to end the farmers' struggle against the diversion of Hirakund dam water to industries. Nobody seems to remember that the farmers require the river water more than anybody else." Water conservation experts from across the country recently gathered in Raipur. They were unanimous that construction of barrages on the Mahanadi to supply water to the industries has disastrous ramifications as they have weakened the natural flow of the river. "The issue of river pollution has been overlooked amid this raging dispute over water distribution. Neither government is ready to discuss how the Mahanadi is dying because of diversion of its water to industries on a large scale. Chhattisgarh and Odisha governments have sanctioned the plan for the death of this river. They are now cunningly implementing it," says Shripad Adhikari, the water conservationist. "Both Chhattisgarh, Odisha regimes want to divert water to industries. They only pretend to fight each other"
Alok Shukla, convenor of the Chhattisgarh Bachao Andolan, says the main issue in the Mahanadi water dispute is the "selling of water to the corporate sector". "The Chhattisgarh government aims to construct power plants with a total capacity of 70,000 MW in the state. In fact, both states have signed several MoUs for building power plants. But they have not worked out the plan for the supply of water to these plants. The Mahanadi is the most likely source. It is futile to expect a rational decision over the Mahanadi river water from the Chhattisgarh government since it has not even formulated a water policy." The chief engineer of Chhattisgarh's water resources department HR Kutare concedes that barrages on the Mahanadi are meant to supply water to industries. Stressing that every government gives priority to the development of its state, Kutare claims only water "harvested during the rainy season will" be used for industrial purposes. Asked whether the Central Water Commission has given permission for building these barrages, Kutare says, "We are constructing only six barrages on the Mahanadi, each of which has an irrigation capacity of less than 2,000 hectares. Therefore, the CWC sanction is not required." "Chhattisgarh is using only 25 per cent water of the Mahanadi river. The rest is still going to waste. What is wrong if the state is safeguarding our water?" he asks. In 1996, a controversy erupted over the diversion of the Kelo river's water to the Jindal power plant in Raigarh. The local farmers protested. On 26 January 1998, an Adivasi woman, Satyabhama Saura, was killed during one such protest. On 26 June 1996, the sponge iron company HEG demanded a daily water supply of 24 lakh litres from the Chhattisgarh State Industrial Development Corporation for its plant in Durg district's Borai. The corporation agreed on the condition that HEG would construct an anicut on the Shivnath river. On 5 October 1998, the task of diverting the water was entrusted to Radius Water Limited after two years of negotiations. The company was owned by Kailash Soni, the owner of Kailash Engineering Corporation, based out of Rajnandgaon. Radius Water went on to sell the water for profit, drawing condemnation nationally and internationally. Private players constructed intake wells on the Kharun to supply industrial units at Siltara, 17 km from Raipur. Many of these wells at Bendri and Murethi villages are still drawing water from the river. This has severely polluted the water and caused outbreaks of diseases among the villagers. Indravati flows through Odisha's Kalahandi region and then through Bastar, Chhattisgarh. In 1978, work began on a hydel project on the river in Odisha's Navrangpur. The project took 23 years to complete. The Odisha government also constructed dams on the river in Khatiguda and Mukhiguda. As a result, the river almost dried downstream in Bastar. After a protracted battle, the Central Water Commission ordered equitable distribution of the river's water between Chhattisgarh and Odisha. A control gate across Jora Nala canal is in the final stage of completion to ensure the implementation of the decision. An under-construction irrigation dam on the Kanhar near Uttar Pradesh's Amwar village has become a bone of contention between Chhattisgarh and UP. The Chhattisgarh government claims the dam would submerge several villages of Balrampur-Ramanujganj district. The state has also objected to the proposed Polavaram dam on the Godavari river in Telangana. At the centre of the dispute is the construction of a 30-km long embankment along the Shabri river, which is likely to displace several thousand Adivasi families inhabiting Konta-Sukma region of Bastar. This article was first published on Catch News. Read the original article.